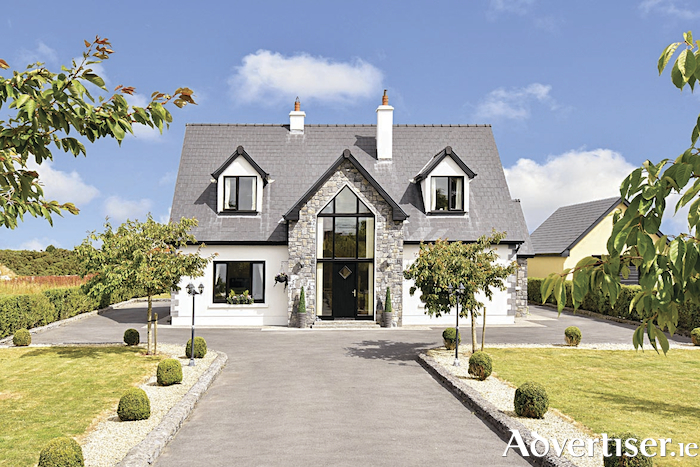 New to the market in recent weeks with Mullery auctioners is a stunning detached residence set in beautiful gardens and located on a quiet road at Knocknagreine, Furbo. This house, known as Ocean View, has been well maintained by its owners and is presented in excellent walk-in condition. The residence boasts bright and generously proportioned accommodation. The hallway is a superb double height space with large glazed sections allowing light to pour in. Off the hall to the left is the living room with feature open fireplace and wooden floors. On the opposite side of the hall there is a spacious open plan living/dining room/kitchen with solid fuel stove. The kitchen is fitted with a range of units and includes integrated appliances. A utility room and large walk-in hot press are situated off the kitchen to the rear. Also on the ground floor is a study/playroom, a double bedroom with en suite, and a guest wc. Moving upstairs, there is a gallery style landing. The master bedroom is a wonderfully spacious room with walk-in wardrobe and en suite. There are a further two bedrooms and a well appointed main bathroom. Outside the grounds are beautifully maintained and bordered to the front with stone wall and gates and to the sides by mature hedging. A driveway leads from the front gates around to the rear of the house where there is a detached garage. There are lawns to the front and rear and a patio area. The location is within a short drive of both Barna and Furbo which offer all conceivable services and amenities including schools, shops, supermarkets, coffee shops, restaurants, hotels, and beaches. Viewing is highly recommended for those seeking a spacious, well presented, home in this highly desirable location. For further details see www.mulleryauctioneers.ie or call Mike Mullery on 087 6424106 or 091 567275.